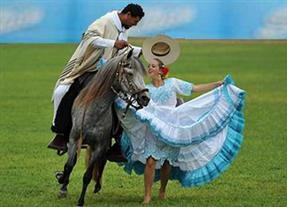 We will visit, one of the most traditionaly ex haciendas, to attend a Peruvian Paso Exhibition. The Peruvian Paso Horse, legacy of the Spanish conquest, is a very special race considered the best saddle horse in the world. The horses’ natural rhythm has won it popularity not only as a show horse, but also a dance partner, riders on horseback will couple with women on foot in a Marinera dance show. We will see the elegant chalanes (typical and traditional paso horse riders) who wear white shirt and trousers, straw hat, vicuña poncho, handkerchief, neckerchief, boots and spurs. Learn about the history of this unique horse and about their training and get to see many horses in different stage of training and age.